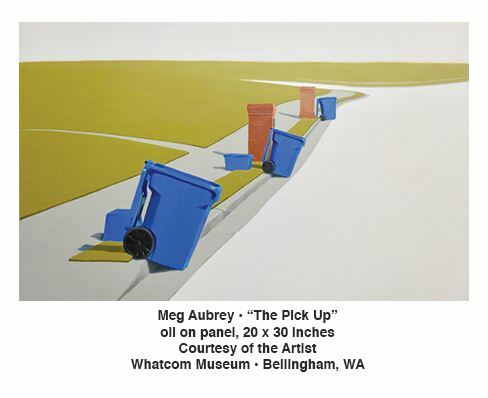 In its third biennial “Bellingham National 2019 Juried Art Exhibition and Awards,” the Whatcom Museum utilized the skills of experienced art historian and curator Bruce Guenther. The theme for this year’s exhibition is “Water’s Edge: Landscapes for Today,” which includes 71 artworks by 57 artists from around the country. As you may expect, Guenther references Bellingham’s location as inspiration for the show’s theme and title, but he also writes in his introductory text that the exhibition “was an invitation for artists to share their observations and feelings about humanity’s ever-changing relationship to nature and life at water’s edge…” Through many different artistic mediums, these artists each grapple with our connection to nature using the landscape as their method of communication. The exhibit is not arranged chronologically or by sub theme, so it is fascinating to think about why Guenther placed artworks next to each other. A particularly striking arrangement includes Natalie Niblack’s “Watershed” (oil on canvas), which is flanked by Naomi Shigeta’s “Sky meets Sea” (oil on panel) and Amy Ferron’s “Over our Heads” (acrylic paint and paper on wood). Niblack’s visually imposing painting depicts a large explosion in the top two-thirds of the picture plane, with a trash-filled ocean below. The flames are painted in extraordinary detail and loom over the viewer. She has also drawn a grid in the white background behind the plume of fire and smoke. Is this her attempt to create an underlying structure beneath the swirling flames? Interestingly, Shigeta and Ferron also utilize straight lines to create structure in their paintings. Shigeta writes in her statement that the painting, especially the distinct vertical lines, “reflects the challenge in keeping balance.” Ferron creates her landscapes by first cutting paper with rotary cutters and X-acto knives and then pasting the pieces together. The result is a mosaic landscape reminiscent of the geometric structures of Nature: tectonic plates, molecules, and others. Connections between Nature, Art, and Science are abundant in the exhibition. There are many photographs, including two tintypes by Alexandra Opie, included in the show which have long been used by scientists to document the natural world. Lynn Skordol printed on a vintage map to create “Map 4” to illustrate how humans have changed the natural landscape over the years. Vanessa Mayoraz’s “Progressions of pernicious change” almost appears to have been taken straight from a science lab. She writes that her “work concerns itself with understanding and decoding our reality,” which beautifully demonstrates the “power of place” that Guenther writes about in his introductory text. Guenther awarded three cash prizes to artists in the exhibition. The Second Place winner was Natalie Niblack. 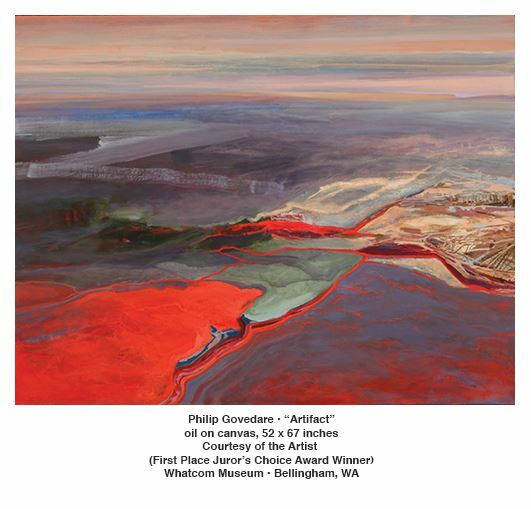 First Place went to Philip Govedare’s vibrant, oil on canvas painting titled “Artifact.” Like other artists in the exhibition, Govedare also contemplates the impact of land use and his paintings are charged with doubt and anxiety about the condition of the landscape. His use of bright red signals alarm. 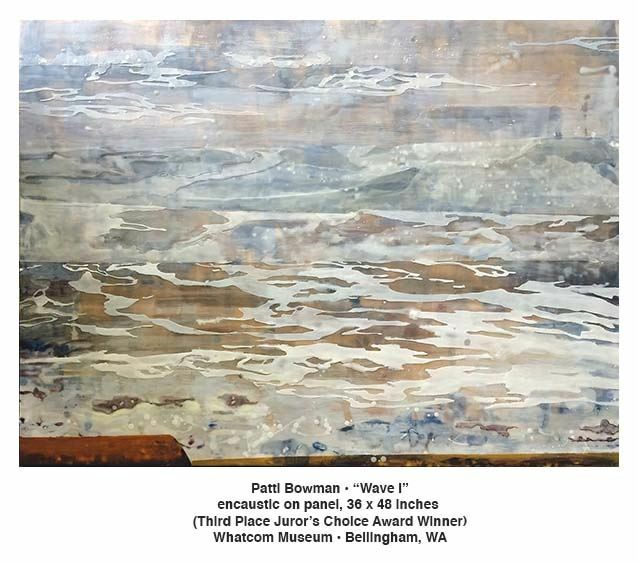 In contrast, the Third Place winner, Patti Bowman connects her encaustic “Wave I” to the effect of gazing at the ocean. The painting purposefully lacks structure to orient the view, which gives the affect of an endless sea or enormous wave filling the picture plane with blue water and white foam. While all three award winners are based in Washington State, the exhibition drew many artists from all around the country. And even though all the artworks are 2-dimensional, the exhibition does not lack in variety of mediums or artistic styles. If you are interested in representational paintings of the landscape, you will find several. If you are looking for abstract paintings seeking to find the essence of nature, Guenther has included many with this exact aim, but they utilize different methods for seeking the “spirit of nature.” The exhibition consists of many paintings, but photographs and prints are also in abundance. There are even several fiber artworks, including Krista Kilvert’s “Altered Landscape” (dye sublimation on polyester) which moved with the air flow as I opened the door to the gallery. As I was leaving the gallery, I looked up at the second story to see a canoe through a cut out in the wall. The canoe is part of the “People of the Sea and Cedar” exhibition and seeing the object beautifully connected both exhibitions through the “power of the essential element Water to life,” as Guenther writes in his text. I suggest visiting both exhibitions while you are at the Whatcom Museum. 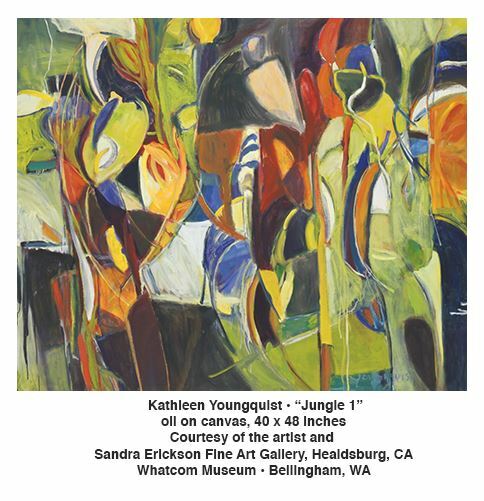 “Bellingham National 2019” is on view Wednesday through Sunday from 12 to 5 P.M. through May 19 at the Whatcom Museum’s Lightcatcher Building, located at 250 Flora Street in Bellingham, Washington. For more information, visit www.whatcommuseum.org. It was three summers ago when I spotted a set of six vintage long-stem aperitif glasses at the Bigelow Block Sale on Queen Anne. I picked one up. I blew on it, though it wasn’t dusty. I set it back down. “Ah,” I said, more of an exhale than a word. I didn’t want to seem too interested. I continued to walk up and down Bigelow because, as any shopper knows, joy is in the pursuit, not in the prize. 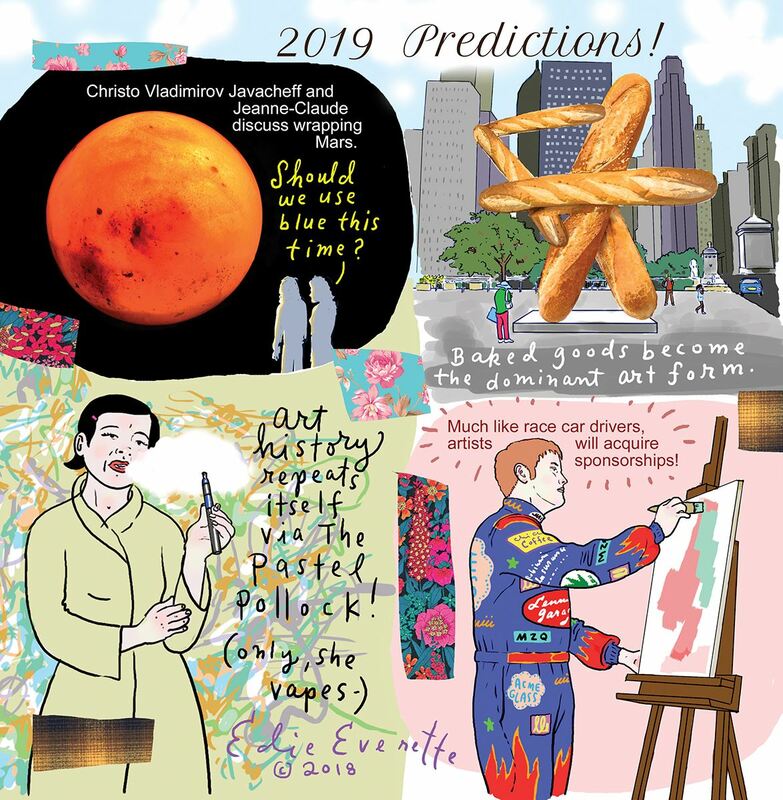 Unless the prize is six vintage long-stem aperitif glasses that belong to a woman who wears a turquoise pendant, turquoise rings. Her love, her pride, for her home was obvious, but her car still had Arizona plates. All this meant to me was that maybe, just maybe, she was moving back to the desert and I’d be able to get a really sweet deal on the glasses. The second time I passed the glasses, I knew I had to have them, a response I have never been able to talk myself out of when it hits, and near the corner of Boston and Bigelow it hit hard. I told myself I’d gift one to each of my friends, but every December I convince myself my friends would probably not love the fragile stems as much as I do. The oddest thing about seeing the glasses is that during all the years I was actually looking for vintage long-stem aperitif glasses, I could never find one. Not at a rummage sale. Not at Goodwill or Value Village. I was remembering all this, when the glasses caught my eye for the third time. The way they gleamed felt like a sign—nothing smaller than a billboard. But this is not what made me walk closer. When I finally decide to buy the glasses, the sale is slowing down, with some people folding up their tables already, but there were my vintage glasses, unsold, flashing me knowing smiles. I imagined that along with those smiles would be tête-à-têtes cozy and intimate, so many things to talk about. And though I would never label a vintage long-stemmed aperitif glass as “stuff,” I know there is a personal fine line between treasure and tchotchke. Besides I need the entire set now that I do believe I have developed into someone who will serve aperitif at her small, but stunning get-together. Even if this is Belltown, circa 2019, basically an Amazon campus, which must hold the record for the fewest vintage long-stemmed aperitif glasses. But I’m okay with that. I have become. Mary Lou Sanelli, writer, speaker, and dance teacher, lives in Seattle. Her forthcoming novel, “The Star Struck Dance Studio (of Yucca Springs)” is to be published in September, 2019 (Chatwin Books). For more information about her and her work, visit www.marylousanelli.com. Hats off to the Bainbridge Island Museum of Art, one of our outstanding regional art museums. Its current feature exhibition of the work of Alfredo Arreguín glows on the walls in the midst of our dark winter days. Alfredo Arreguín populates his wonderland of jungles and seascapes with animals, fish, insects, and birds. Then he embeds in this dense matrix of colors and shapes the faces of well known political activists, writers, poets, friends, and occasionally, himself. The faces deeply disguised within the vast details of the paintings, point to Arreguín’s belief in the harmony of nature, the balance of life, and the crucial place that we have within it, rather than outside it. His work has never been more timely or important. Arreguín’s several themes, nature, Madonnas, and portraiture overlap and intersect. In every detail of these intricate works, he contradicts the angry rhetoric of racists creating arbitrary divisions in our beautiful world. Leaping salmon and whales remind us that the survival of the Southern Resident pod of orcas is hanging in the balance. As the whales dwindle in response to environmental degradation, and the salmon fail to complete their migration upstream because of dams, Arreguín’s paintings celebrate natural processes and inspire us to protect our Salish Sea. Arreguín’s life story is unusual. He was born in Morelia, Michoacán Mexico, as an illegitimate child, and passed from one relative to another. On a few occasions, he had the opportunity to be immersed in the jungle, experiences that made a deep and permanent impression on him. He also had enough educational opportunities to learn art as he moved from Morelia to Mexico City. But by extraordinary serendipity he was invited to live in Seattle by a family he met when they were lost as tourists in Chapultepec park. As a result, he came to the U.S. in January 1956, and gained citizenship with their sponsorship. After serving in the army in Korea (where he introduced himself to Asian art), he attended the University of Washington, earning two degrees, then found his way as an artist by the mid 1970s in the style that he still practices. He began to appear in major exhibitions almost immediately. The National Museum of American Art acquired his work in the early 1990s. 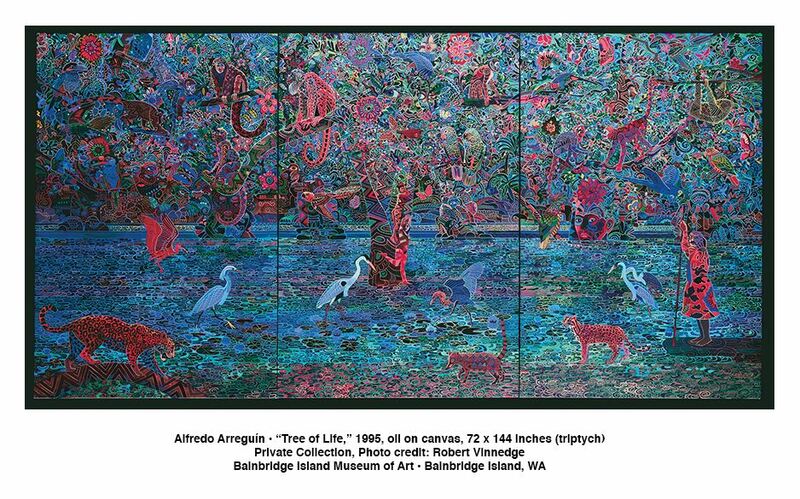 “Life Patterns” includes works from Bainbridge Island Museum of Art’s permanent collection, promised gifts, and loans from private collections and the artist himself, for a total of almost fifty works for this 50 year retrospective. 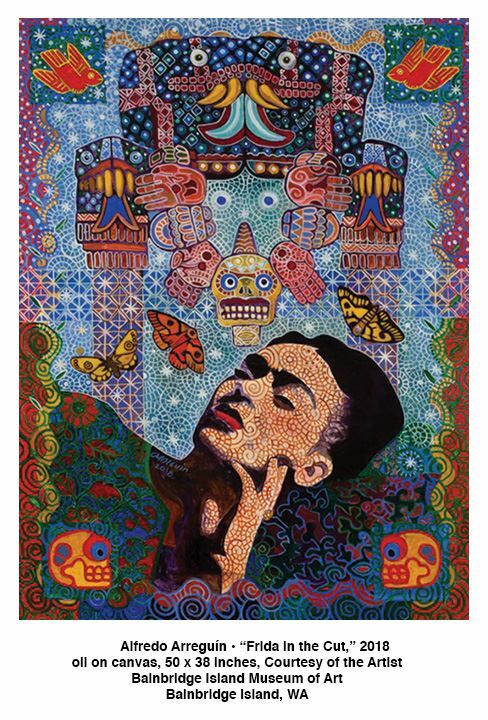 Arreguín began honoring Frida Kahlo many years before she became a pop icon. They share a love of folk art, peasant expressions, nature, music, and the sensuality of life. Arreguín transmits folk art patterns and their motifs in one layer of his dense jungle tapestries, but more than that Frida as well as Arreguín embraced the spiritual significance of ordinary people’s beliefs in Mexico, beliefs that survive transformed to this day. Likewise Arreguín’s love of literature and language pervades his paintings, sometimes literally in his homages to his Seattle friends Raymond Carver and Tess Gallagher, other times more subtly as in his homage to Pablo Neruda. Also look for his portraits of indigenous environmentalists, well known activists, and revolutionaries. 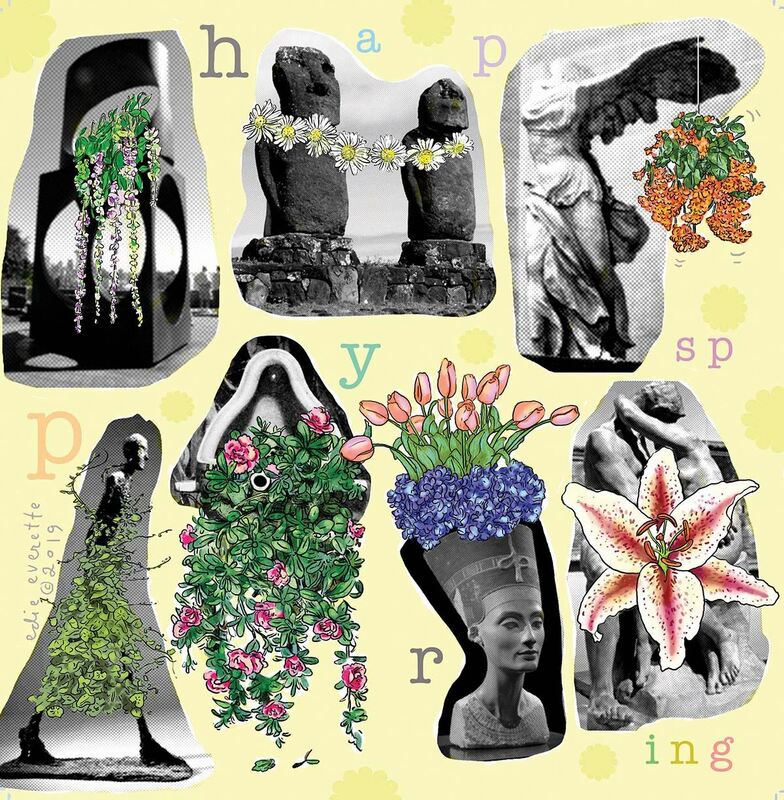 In addition to this featured exhibition, the Bainbridge Island Museum of Art is also showing a traveling exhibition of 53 artists’ books titled “Borderland-Arkir Book Arts Group/Iceland which addresses the concept of land. 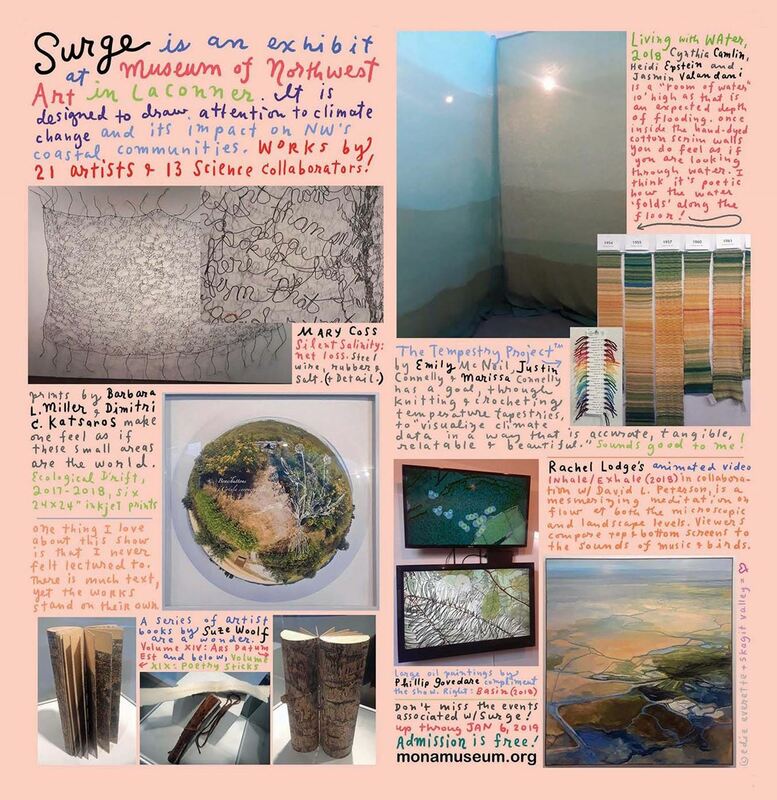 It is supplemented by a selection of the Artists’ Books from the Collection of Cynthia Sears, the visionary founder of the Museum. Artists’ Books are a particular passion of Sears. 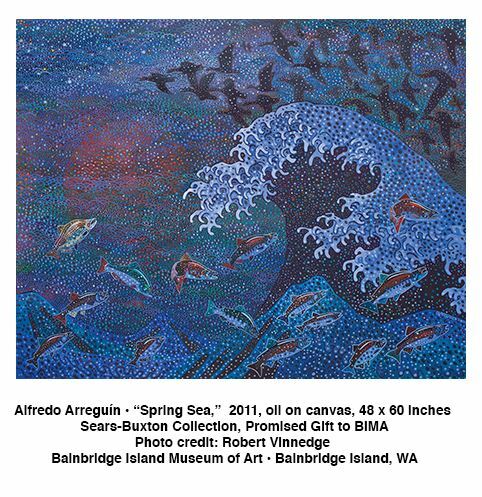 She has also promised two paintings by Arreguín to the Museum from the Sears-Buxton collection, and already donated the signature Arreguín painting “Salish Sea” of 2017. It is hard to believe that the Bainbridge Island Museum of Art is only five years old. What a success it has become and what a gift to our art community. Only a short walk from the ferry, it is free of charge and open seven days a week. Susan Noyes Platt writes a blog www.artandpoliticsnow.com and for local, national, and international publications. 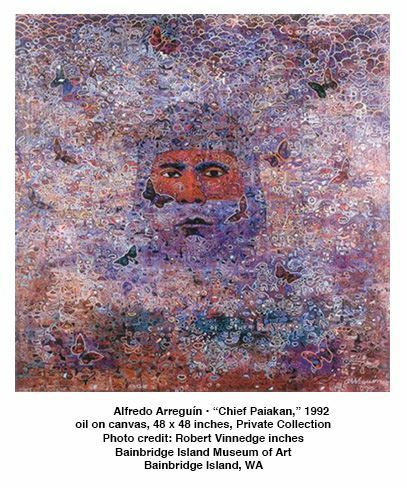 “Alfredo Arreguín: Life Patterns” is on view through February 3 at the Bainbridge Island Museum of Art located at 550 Winslow Way on Bainbridge Island, Washington. Open daily 10 A.M. to 6 P.M. For more information, visit www.biartmuseum.org. We have friendships for many different reasons. And for many of us, this has little to do with reducing our relationships to likes and followers. We are looking for…more. I have terrific women friends. Wise, wonderful, and fun (for the most part). And I have James. His most admirable quality is that he is without pretense.“What’s on your mind, darling?,” he’ll say, flashing a smile, which I believe is the most generous way to begin a conversation, before lowering his gaze as if he’s about to hear one of life’s sacred secrets. Or, you know, whatever is bothering me. There are few conversations in life when, regardless of the subject matter, when it’s as if all your thoughts and emotions are aligned with all of your friend’s thoughts and emotions. Our whole conversation reminded me of the day I was waiting in line at Whole Foods and chatting with the guy behind me. We were talking fruit in season, that kind of thing, except he kept looking at his phone. I tried to overlook it, be cool, be current, but it always feels like being put on hold. Even now I think of him talking and scrolling at the same time, and I see a gutless way to communicate. I wanted to shout we do exist without our phones. Because we do. We really do. WE are the real thing. And these days it seems like most of us are missing it. I came right out and asked him what is so important that he has to be in on it even as he lays produce on the conveyor belt. It was one of those ridiculous things I hear myself say sometimes, knowing I’m being brash, but I say it anyway. As if I knew nothing. At any rate, she reminded me that since I do have more years behind me, I’ve attained more success, too, more independence. So I can enjoy a little harmless chitchat, and, okay, a little harmless flirting, without checking in. My flesh may be softer but my attitude is firm: If I’ve learned one thing, it’s how one shared idea, opinion, or observation can lift us out of ourselves and make everything around us seem more, dare I use the word, connected. And, yes, I may very well be hoping for a miracle. But if you are shopping at Whole Foods you are certainly paying enough for a miracle. So I say thank goodness for James, who is one of the most successful business men I know, yet he still knows how to leave his phone off for however long it takes. Life may be going on at a hectic pace around the two of us, but he’d never let something as expansive and beneficial as our friendship be dwarfed by something small and addicting as a phone. Oh, I am thrilled to know James is free to take a walk later. He will pick the route and I will take his arm. Mary Lou Sanelli’s Write of Way has been a part of Art Access since 2004. For more information about her and her work, visit www.marylousanelli.com. Paul Hunter is a Seattle poet and fiction writer who works on farming articles and reviews for Small Farmers Journal. He recently published, Clownery, a book of autobiographical prose poems. Seattle welcomes from Jodhpur, the capital of colorful Rajasthan, the largest collection of objects from a royal kingdom ever to leave India! “Peacock in the Desert: The Royal Arts of Jodhpur, India,” on loan from The Mehrangarh Museum Trust, fills the fourth floor special exhibition galleries of the Seattle Art Museum. But it starts with an immersive wedding installation on the third floor! The installation, based on a royal wedding procession of the “homecoming” of the bride, includes an elephant mannequin with a gilded ‘howdah’ and elaborate adornments, as well as horse mannequins with full regalia and jewelry. The bride would be hidden from view in a curtained palanquin. Video projections present the procession of the 2010 marriage of Yuvrain Gayatri kumari Pal from the former royal family of Askot in the Himalayan foothills to Yuvraj Shivraj Singh son of the current Majarajah. A wall of famous “paag” or turbans contain many layers of symbolism and make the most of the double height gallery. The current Maharajah His Highness GajSingh II ascended to the throne at the age of 4. Adapting to many changes in the status of the former Princely States, he has succeeded in reinventing his role as a private citizen. Reflecting his ability to innovate while honoring tradition, one major theme of this exhibition is “tradition and continuity.” The royal homecoming procession is one example of that. At the entrance to the fourth floor gallery stunning photographs present the landscape in Marwar-Jodhpur as well as the history of the Rathores who ruled from the 13th to the mid 20th century. In the same gallery a dramatic gilded palanquin evokes royal processions and a large cradle for Krishna makes a reference to spiritual loyalties. 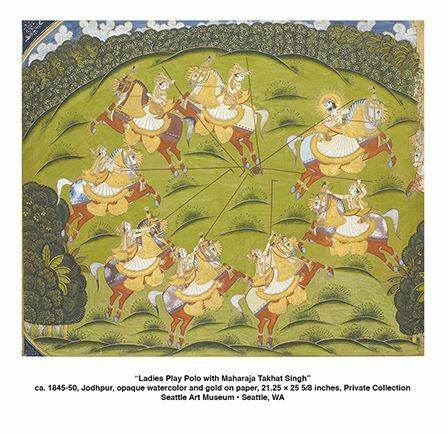 As we enter the “The Rathores of Marwar” paintings depict the descent of the Rathore kings from the Hindu god Rama as well as worship of the Goddess Devi and many portraits of the Maharajas. “Conquest and Alliance: The Rathores and the Mughals” presents the long relationship with the Mughals both in battle and in court, through intermarriage and cultural exchanges. For example, the builder of the Taj Mahal, Shah Jahan, is the son of the marriage of Akbar’s son and a Rajput princess. In this gallery a full scale 17th century Indian court tent Lal Dera fills the space, alongside references to military weapons and other objects exchanged or altered by the many years of serving in Mughal campaigns all over India. The wedding installation links to the theme of the “Zenana: Cross Cultural Encounters” the role of women as bearers of culture. Far from simply being enclosed in the “Zenana” or women’s quarters, royal women brought new cultural traditions when they married into the Jodhpur court. The Zenana here features a full pavilion, as well as textiles, jewels, and dresses and invokes the musicians, dancers, and artists who lived or visited the women of the court. A personal shrine to Krishna made of silver includes a small statue of the deity: it was the focus of a daily ritual. The “Durbar: Rathore Court” marks the era after 1707 when the Rathores were liberated from Mughal control as the Mughals weakened. Many artists came to Jodhpur from the Mughal Courts leading to a flowering of creativity in painting, textiles, tents, arms, and jewelry. In a sequence of alcoves, a selection of devotional paintings introduces Krishna and his familiar frolics with gopis, but don’t miss in this gallery the trademark watercolor of the exhibition, “Shiva on his Vimana” (aircraft!—a huge bird). The last section of the exhibition “The Raj” presents the final diplomatic and cultural exchange of the princely court, with the British Empire. All of the princely states worked with the Raj, rather than resisting it. We see this most obviously in the portraits and photographs of the Maharajahs of this era, with dress and jewelry that bring together traditions from India and Great Britain. Also showing cultural exchange is the Umaid Bahwan palace where the family now lives, designed in the 1920s by Henry Lanchester, an English architect, who combined Art Deco and Indian motifs. A large part of the palace today is a hotel, another innovation of the current Maharajah. 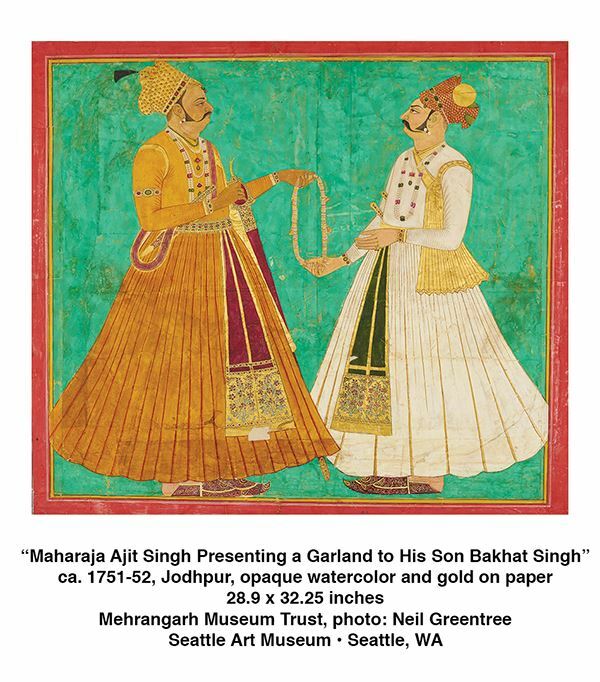 He has been a major catalyst for tourism in Jodhpur by renovating the Mehrangarh Museum, not to mention sending this exhibition to the United States (it is making only three stops). “Peacock in the Desert” is a perfect title for the exhibition. The exhibition, like India itself, is full of elaborate objects, stunning color, and fascinating history. To expand our experience, the museum has organized a film series, a Diwali family festival, presentations on South Indian court dance and saris, and a program on the “Songs of Rajasthan.” Check the museum website for more details. Susan Noyes Platt writes a blog www.artandpoliticsnow.com and for local, national, and international publications. 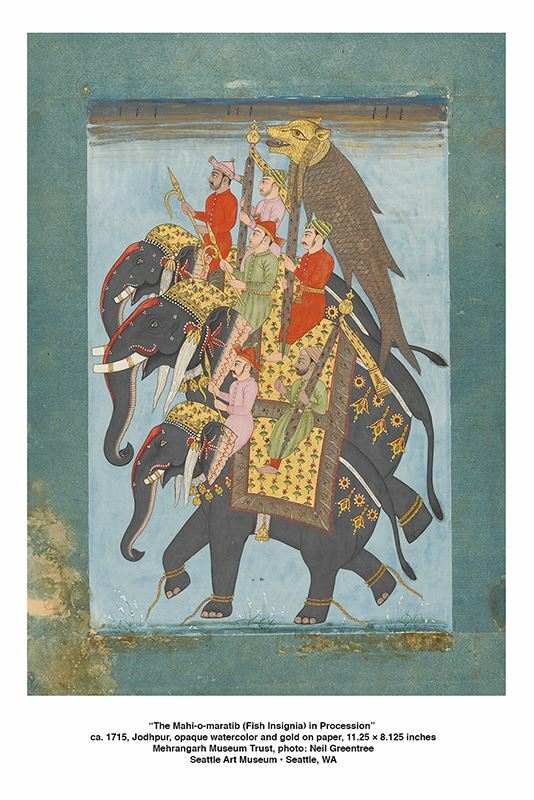 “Peacock in the Desert: The Royal Arts of Jodhpur, India,” is on view until January 21 at Seattle Art Museum, located at 1300 First Avenue in Seattle, Washington, Friday through Wednesday from 10 A.M. to 5 P.M. and Thursday from 10 A.M. to 9 P.M. For more information, visit www.seattleartmuseum.org. Last week, I arrived in Port Angeles to teach a choreography class. I’ve known the director since she struggled with the idea of opening a studio. Her dance journey has been like witnessing a beautiful becoming. It’s been a long drive from Seattle. I’m eager to stretch, but I’m so taken by what happens next it literally stops me in my tracks. A little boy watches his sister’s ballet class as intently as someone viewing their own version of joy. He copies every move the girls make. I know his excitement, his readiness, as well as I know my own. “Not in Port Angeles,” she said, as if ballet isn’t something her son should get too close to. The boy looked at me, at his mother, back at me. He jammed his fist into the palm of his hand. It was like watching a leaf wilt on the vine. The boy smiled happily, if tentatively, stopping for a quick look at his mom who seemed a little stunned. The truth is that all children are natural born dancers. It’s only later that we learn to suppress the desire to move to the music we hear. I would not have put it like this, of course, but I had a deep sense that this bias would help shape this boy’s future. There is a magic inherent in a dance studio, in being surrounded by people who look like they’ve found what makes them feel most alive. I think this is what the boy wanted for himself, to move enjoyably through space. But I suspect he may have to learn to do it in other ways, most likely on the ball field. And I cannot know if playing ball will make him as happy as dancing seemed to make him. Any more that I can know why his mother was so offended by it. But if I let myself remember what must have been happening in this little boy’s mind to make him look so happy, I suspect I found his mother’s response asked of me something that I found impossible to give—silence. Sanelli, a writer and speaker, lives in Seattle. She is a regular contributor to Dance Teacher magazine. Her latest book is A Woman Writing. For more information about her and her work, visit www.marylousanelli.com.